Craps is a dice game that involves predicting the outcome of the roll of dice and betting on the same. Most casinos also allow players to roll the dice when it is their turn. A player can choose either to roll or to pass his move by offering the dice to the next player in the rotation. However, it is often recommended that when a player is given the chance to roll the dice, he should take it. It not only gives you a control over the game but also the power to change it. Even though the occurrence of numbers in a dice roll is completely a matter of chance, you should still know how to shoot dice properly if you want to increase the probability of getting your desired sum. 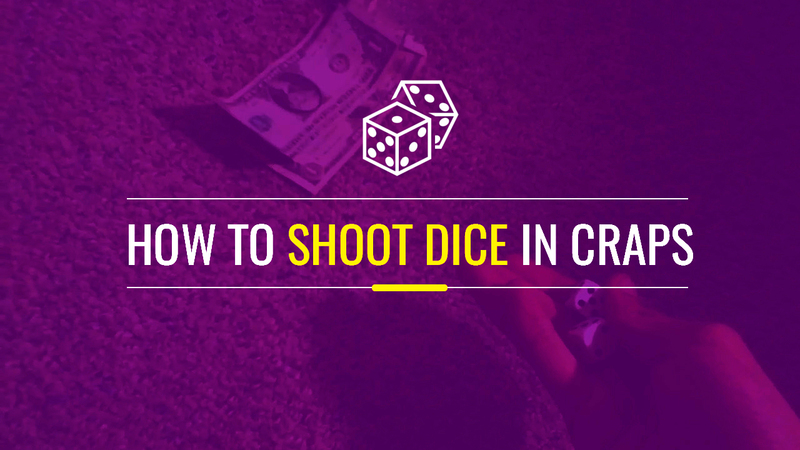 Here’s how to shoot dice in a craps table game. Before you actually start shooting dice in a real casino, you should practice some at home. This is especially important for beginners. First of all, you should learn all the rules of playing a dice and of the pass line. The pass line bet is the most common in craps game and its outcome decides how the dice will be passed around the table. This is the first bet played in the game of craps. It starts with a comeout roll. The bets are placed before the comeout by the players by placing chips in the area marked “pass line.” The current shooter makes the pass bet. If he doesn’t want to bet on the pass, the next player becomes the shooter and makes the pass bet. After that, the comeout roll takes place. Based on the outcome of the comeout roll, the pass bettors win or loss or take specific actions. Free odds bet: Free odds can be placed by a bettor to back his pass or come bet. These are paid at true odds since casinos do not take a portion of it. Don’t pass or don’t come bet: It is opposite of pass and come bets used by don’t bettors. Place bets: These bets do not involve the comeout. You win based on whichever number you choose to bet on. Lay odds: These are used by don’t bettors to lay the odds. If you are looking to shoot better dice in craps, you should definitely get yourself familiar with the following terminologies. Shooter: the player who has to roll the dice. Comeout: The first roll of a pass bet round. Pass: The pass line is the region between two lines that extend throughout the table. Pass bets are placed in that area. Craps: The rolling of 2, 3 or 12 is called craps. Seven Out: When a 7 occurs before the point is repeated, the pass bettors lose. It is called seven out. Now that you know everything there is know about the game, let’s learn to shoot the best dice in the game of craps. The shooter position is offered to the next player (clockwise) around the table when the current shooter sevens out. It comes to you when it is your turn to shoot. The dice are given to the shooter by the stickman. You may choose any two dice from the available options, although all dice are identical. When you become the shooter, the next thing you need to do is make a pass bet. Once you do that, you can roll the dice. The dice must be rolled toward the other end of the table and far from your end. It should be as random as possible and must not be rigged anyhow. It is important to obey the table rules when shooting the dice. In order to make money at craps, you need to roll fewer 7s than usual to make more points before seven-out. It is even more important for players who are backing their pass bets with free odds as they can make big wins only by making points, which cannot be done if you keep getting 7 on the roll. Dice control technique is used by many professional craps players to successfully control the rolling of their dice. However, it is not actually possible to control the outcomes of a dice roll, you can only limit it to a certain extent. That is what this technique is all about. Another thing to note is that it is a physical skill and not something that everyone can do. Here are some tips to get better at it. 1. Set the dice such that a 3 face is on top of both dice and the diagonal lines formed by these 3 spots are parallel on two dice. However, other players might not wait for you while you set your dice so be fast in finding the right faces to put on top. 2. Put the dice between your forefinger and thumb. 3. Release the dice in an arc shape by swinging your arm in a pendulum motion. Avoid putting any spin on the dice so that it doesn’t make many rotations in the air. Throw such that the dice stay as together as possible before they touch the surface of the table. 4. The dice must hit the opposite wall and drop on the table. The idea is to make the dice stop quickly without making too many bounces. Practice this technique as much as you can at home before trying it in an actual casino.